Pharmaceutical Name: Herba seu Radix Cirsii japonici. Botanical Name: Cirsium japonicum DC. Part Used & Method for Pharmaceutical Preparations: The aerial parts of the plant are gathered in summer or autumn when the thistle is flowering. The root can be dug in late autumn. Both are dried in the sun and cut into pieces. Properties & Taste: Sweet, bitter and cool. Functions: 1. To cool blood and stop bleeding; 2. To reduce swelling and resolve stagnation. 1. Hemorrhages due to extravasation of blood by heat manifested as cough with blood, epistaxis, uterine bleeding, and hematuria. Japanese thistle (Daji) is used with Small thistle (Xiaoji) and Biota tops (Cebaiye). 2. Boils, carbuncles and swelling. 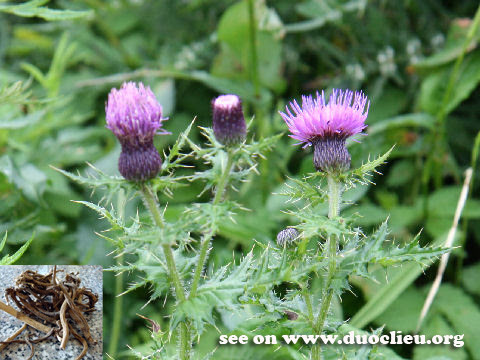 Japanese thistle (Daji) is used both externally and internally. Research shows that it is effective in treating hypertension and hepatitis. Dosage:10-15 g , or 30- 60 g fresh herb, decocted in water for an oral dose. Appropriate quantity for external application.